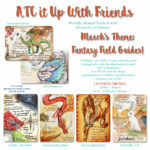 #FabricATCitup – SPECIAL FANTASY FABRIC ATC Swap! TO SIGN UP: You must READ THIS BLOG POST! – then fill out the questionnaire form at the bottom of this page (only fill it out the first time you join the group, all other times you signup you can just email me pabkins @ gmail .com to signup) – I know it’s long but PLEASE READ IT, the reason it’s so long is because I want everyone to know how its run and what the standards are. I’m actually really easy going, so don’t let all this FAQ scare you! SPECIAL FANTASY FABRIC ATC Swap! For this swap your card must be made out of fabric and include sewing elements. That means you can crochet, sew, handsew, machine sew, embroider etc as long as you use some fabric and thread. You can also paint on it! I recommend drawing your image and then stitching or sewing over and hey throw whatever color you want on there with another medium as long as it doesn’t shed. Please no large bulky cards or buttons. The cards must still fit comfortably inside a ATC plastic sleeve. You should attempt to make it fantasy in theme so that way you have a direction to go in. That means don’t just stitch some lines and a heart and call it done. This is a CHALLENGE so challenge yourself and have fun. If in doubt or you have questions please message me. You know I don’t bite! A few of our fellow artists have been waiting a year for this special fabric swap so lets all not disappoint and make some super fun cool cards to add to our collections. – CREATE a minimum of 2 but preferably 3 ORIGINAL FABRIC ATCs. Heck if you are so unsure about this and all you can manage is 1 then I won’t turn you away. No Political or Religious cards permitted. Or I will need to return them unswapped. – SIZE MATTERS! Cards absolutely must be the standard size of 2.5 x 3.5 inches NO LARGER! NO SMALLER! and fit comfortably inside a plastic trading card penny sleeve. No buttons, sequins are ok, and nothing that sheds. I recommend sewing your edges or adding “fray check” so they don’t fray and fall apart. – All Cards must be RECEIVED by Pabkins on or before the DUE DATE! I try to give a short 5-7 day grace period if you’ve mailed out in a timely manner and notified me asap. – SHARE ON SOCIAL MEDIA! – it helps our litle ATC trade event grow and builds a sense of community. So post your WIP cards! Post your finished cards! you can even post the cards you receive in return! on instagram and hashtag #FabricATCitup. – U.S. ARTISTS: include 2 Postage stamps, or however many it cost you to mail your envelope! So if your cards are heavy then 2 postage stamps (please don’t forget – many of you have been forgetting) – see above for info on typical costs for mailing cards. I attempt to mail return Envelopes back out within 12 days after the Due date.